Hey guys! I’m Katie from AbellasBraids! Whenever I get a chance to go out on a date with my man, I always want a fresh new look for my hair! 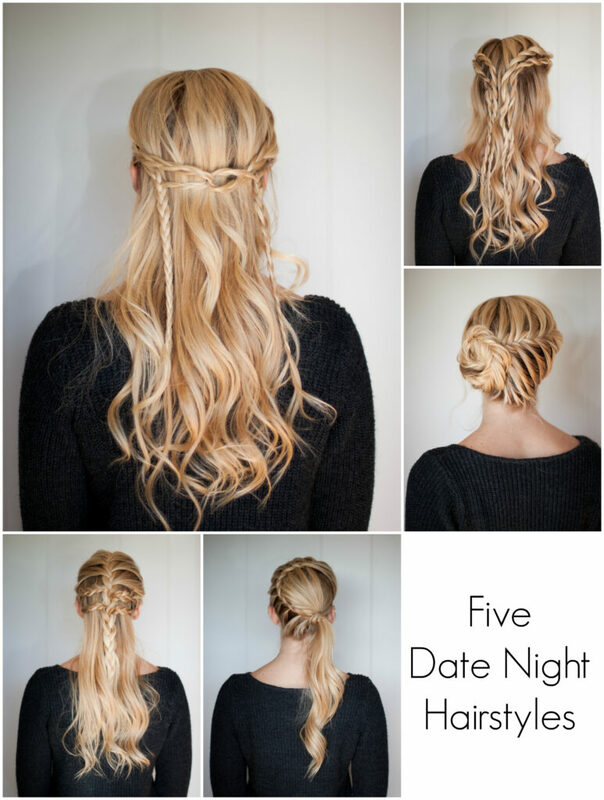 We’ve come up with five different ideas, perfect for a night out with your significant other! We always like to start out with some loose curls to add a little texture. It also gives the hair a soft, romantic look when it’s worn part way down. Before curling, we started off using dry shampoo, which gives a little bit of lift at the roots and also takes away any oil you may have. The curls were made using a 1″ curling wand. The curls don’t need to be perfect, just roughly done and you can use your favorite curling wand. If you don’t own a curling wand, you can use an iron the same way you would use a wand, just ignore the spring part and wrap the hair around the whole thing. 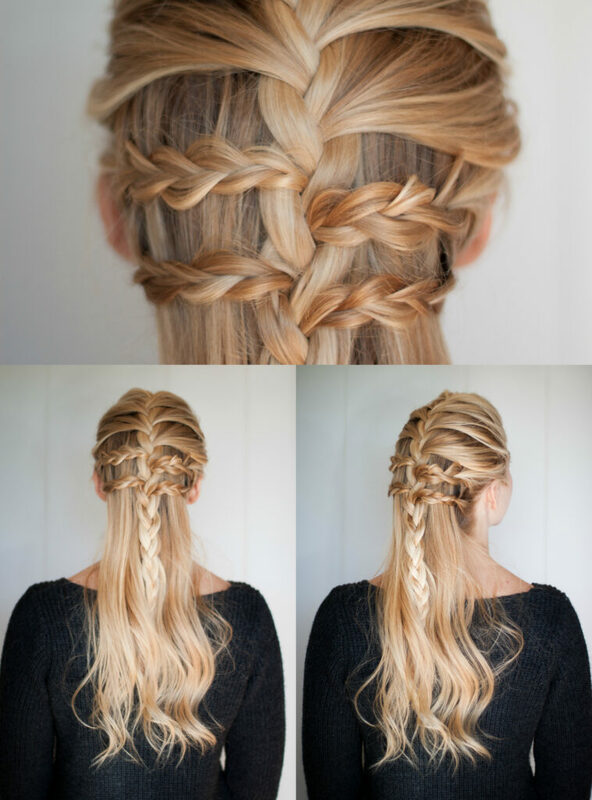 The first style incorporates three strand braids and a French braid. 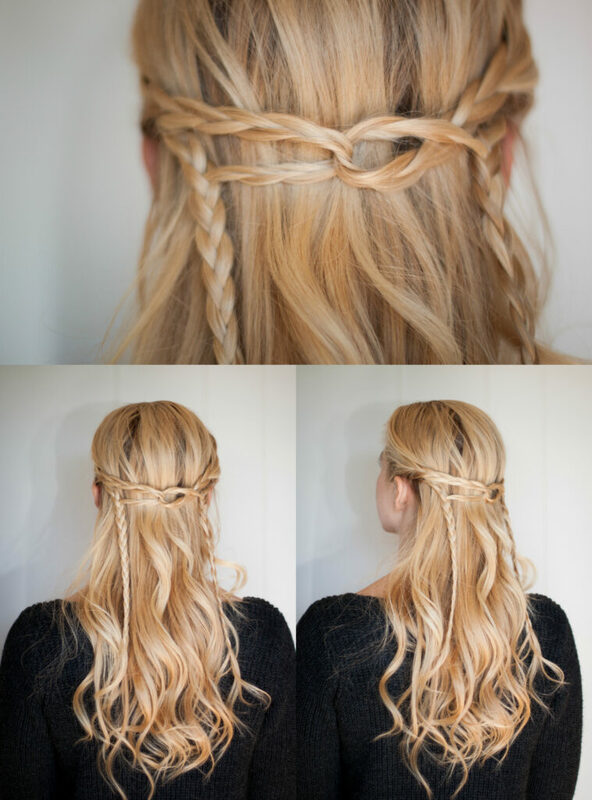 Start by loosely french braiding the hair in the front. Stop a little before you get to the half up point. Braid a little ways to hold it into place and add a pin or elastic so you can come back to it later. On each side, do two braids, one right below the other with hair from the outside edges. You can gently tug on the outsides of each section to pancake it a little. Go back to the French braid and unbraid up to the point where you stopped adding in hair to the French braid. Continue with a three strand braid, but add in the four braids from the second step as you go, one at a time, alternating sides. I love this style because it’s fun and flirty but super simple! The second style is great because it looks more complicated than it is! 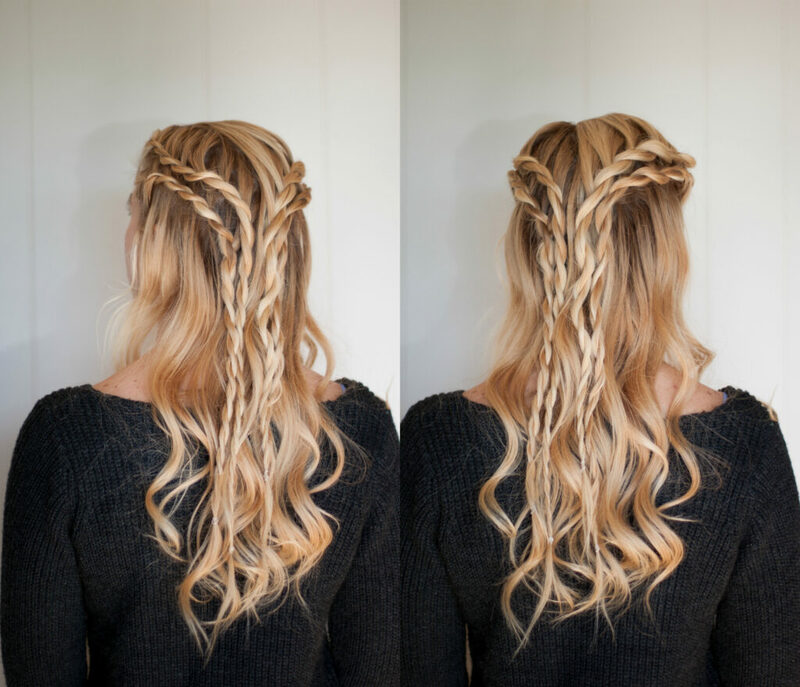 It’s perfect if you just want a small accent braid but you still want to be creative. It’s simply two braids in the front, tied in the back and then the ends are incorporated into a braid on each side. When you tie the hair in the back, give it a 180 degree turn to open it out instead of it laying flat. Our third style is simply four lace twists. This can also be done as three strand lace braids if you’re not familiar with twists. Do a lace braid on each side of the head, finish by braiding down to the ends, then do another lace twist under each of these. For the braider that’s a little more advanced, this one is perfect! Start a French fishtail braid on the front/side of the head and take it horizontally across. Finish by fishtail braiding to the ends, pancaking it and curling it into a loose bun. Make sure to leave some pieces out around the hairline to soften the look! Touch them up with the curling iron if needed and use an aerosol hairspray to hold the look. 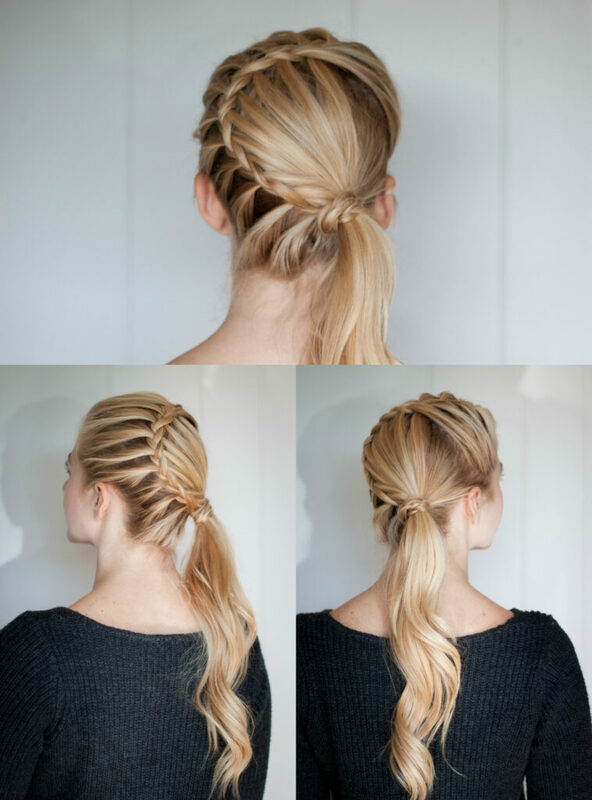 Start off with a diagonal French braid then switch over to a lace braid. When you switch to the lace braid, at the same time, leave waterfall pieces out on the inside section. Collect all the hair at the end and put it into a side ponytail. Finish it off with by wrapping the elastic with a small braid. 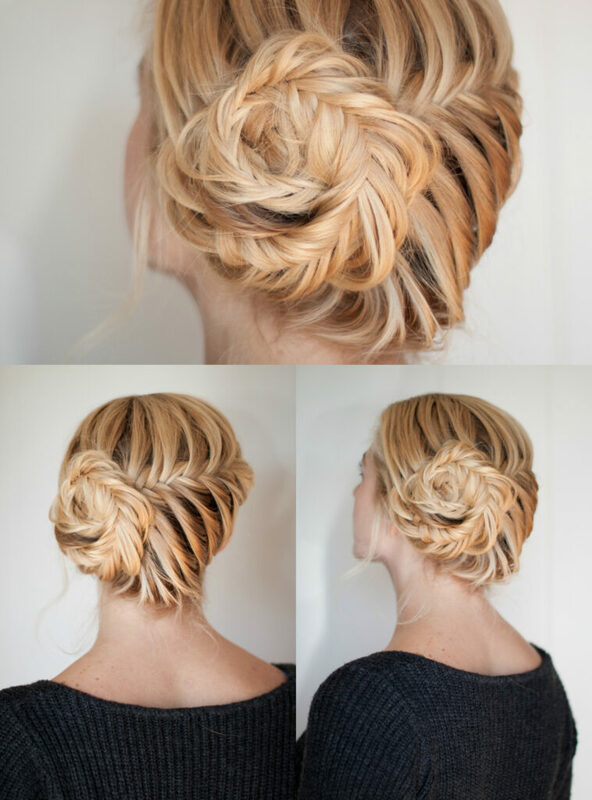 I love the braid wrapped elastic because it hides it and also adds a little elegant touch! The biggest key to coming up with a great new style is pushing yourself to start braiding in a place you haven’t started before. If you usually do a braid in the middle, try starting out on the side, or even upside down! Most importantly, have FUN with it and get lots of practice! Whenever I need to come up with a new style, I pick up some hair, start braiding and see where it takes me! Don’t be afraid to try something new! We are so excited to be able to share our braids with all of you and hope you love the things we come up with throughout the year! For more great hairstyles for all occasions check out AbellasBraids!